A 21-year-old man has been arrested in connection with the death of a chef in Edinburgh. 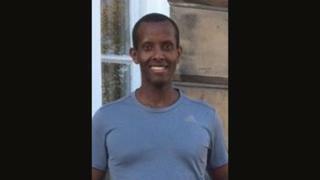 Lionel Simenya, 36, died on Ford's Road in the Saughton area of the city at about 03:50 on 7 March. Detectives said Mr Simenya, who would have been 37 on Wednesday, was struck by a car. The chef was originally from Burundi and had lived in the UK for several years. At the time of his death, he was working in Gorgie. In a media conference, his brother Nicolas said: "Lionel worked hard and never asked for help from anyone. "He should be living his life to the fullest, instead of having been cruelly taken away from us."